It’s been announced that this week’s issue of Young Magazine will have a special chapter of XXXHOLiC in collaboration with Suga Shikao’s new song Anata hitori dake shiawase ni naru koto wa yurusa renai no yo (あなたひとりだけ 幸せになることは 許されないのよ). The song is part of Suga Shikao’s new album, THE LAST, which will be released on January 20, 2016. Entitled “‘XXXHOLiC’ Special Edition inspired by Suga Shikao’s ‘Anata hitori dake shiawase ni naru koto wa yurusa renai no yo'”, the special short comic is Suga Shikao’s desire to represent the song in an illustrated format and the invitation to CLAMP came from Suga Shikao himself, and he describes it as a “dream collaboration”. This week’s issue of Young Magazine is also supposed to carry a new XXXHOLiC Rei chapter, it is unclear whether the chapter is still scheduled (as according to CLAMP-NET.COM) or not. Update: RAW Japanese scans available here. Also, it turns out that this was the only XXXHOLiC appearance in this week’s Young Magazine. The next chapter of XXXHOLiC Rei has been postponed to January 18. The magazine also points out that the collaboration is not limited to this short comic and will be extended to the song’s PV that is coming soon. Update 2: English translations now available. The single of Suga Shikao’s NOBODY KNOWS (XXXHOLiC◆Kei Opening Theme) has been released in Japan today. has some nice links to direct download the Special Edition, which contains, apart from the main song, two extra tracks, booklet scans (with illustration drawn by CLAMP), wallpapers and a screen-saver with the anime PV. On these very quiet days, here are some news for you! A week after the release of Tsubasa #23, let’s take a look at its performance in the most important japanese charts. Suga Shikao will repeat his role as Opening Theme singer for xxxHOLiC◆Kei, the new season of XXXHOLiC, which premieres next April. The announcement was made yesterday in his official website. 1. NOBODY KNOWS (xxxHOLiC◆Kei Opening Theme). 3. Combini (of “Convenience” store). The release date is scheduled for May 14th, and CLAMP will draw the jacket illustration for its special edition. We all expected this, at least I did, but it’s so much better when it’s confirmed! What can I say? I couldn’t be any happier~! I was introduced to Suga Shikao thanks to XXXHOLiC and as of today he remains being one of my favorite japanese artists. It’s totally awesome to have him back playing one more song for XXXHOLiC, there’s no better choice to sing XXXHOLiC songs other than himself. 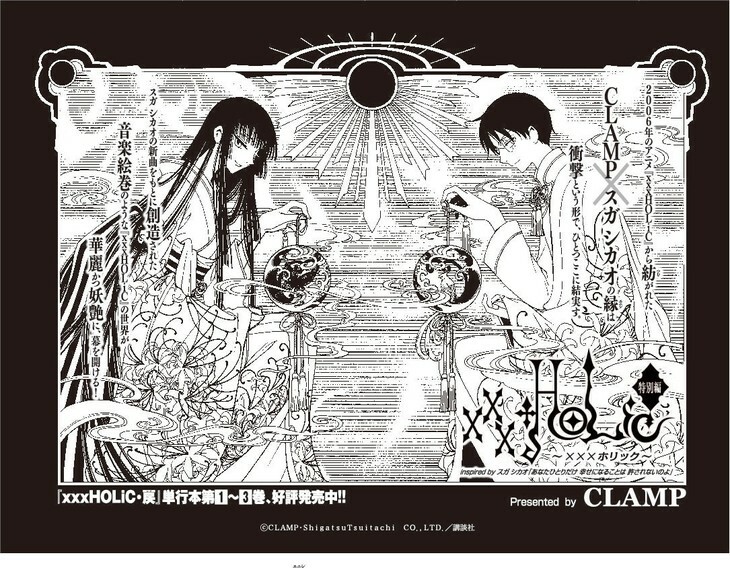 And this time we have a plus, CLAMP will draw the package illustration, being the first time they draw a single package for XXXHOLiC’s anime. Lately, I mean, after XXXHOLiC anime started, I’ve been very interested in Suga Shikao’s music, so I went to search for his discography and hey, the guy is pretty awesome ! So I thought that maybe you guys would also want to listen to others songs of him, in case you haven’t.